On May 2nd, the European Commission published its proposal for the next Multiannual Financial Framework (MFF) that will cover the period 2021-2027. Overall, the Commission has proposed a long-term budget of €1,135 billion in commitments (2018 prices) over the period, equivalent to 1.11% of the (now) EU27’s Gross National Income (GNI). This MFF has to take into account two major challenges: Brexit, which means the EU will lose the UK contribution to its budget and a series of emerging challenges that the EU must now provide the financial means to tackle. As a result, new and increased budgets are proposed for defence and security as well as migration and border management. 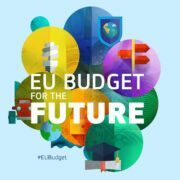 More established areas such as research and innovation, youth and digitalisation would also benefit from stronger budgets: the Commission has proposed to double the Erasmus+ budget and that Horizon Europe, successor of Horizon 2020, would receive €97.6 billion. On the other hand, the two biggest areas of expenditure, Cohesion policy (ERDF and ESF) and the Common Agricultural Policy (CAP) whould however see their budgets cut by around 5% each. Significantly, Cohesion policy will continue to support investment across the EU – including in ‘’More Developed Regions’’ such as Ireland’s – but would henceforth have additional roles in new priorities such as structural reforms to Member State’s economies and the integration of migrants. Regarding the CAP, the two-pillar architecture would be maintained. The Commission proposes to cap direct payments (1st pillar) to farmers in an attempt to redirect financial support to smaller farms and is also seeking to increase national co-financing rates for rural development measures (2nd pillar). Following on its commitment to bolster the Economic and Monetary Union, the European Commission has proposed several new mechanisms and programmes such as a €25 billion Reform Support Programme (offering financial and technical support for reforms to address economic problems in euro zone countries or countries that want to join the euro) and a €30 billion European Investment Stabilisation Function loan mechanism for euro zone members to absorb large economic shocks not of their own making. The text includes proposals to further simplify the budget structure, making it more flexible and introduces a new feature – the respect of the rule of law – as a precondition to receive EU funding. The Commission proposal also foresees a modernising of the sources of funding for the EU budget. As well as removing all national rebates, this envisages an expanded system of‘’own resources’’ including revenues derived from an automatic share of the European Emissions Trading System revenue, a common consolidated corporate tax base (CCCTB) and national contributions based on the amount of non-recyclable plastic packaging waste. Now that the proposal is on the table, the decision on the future long-term EU budget will proceed to the Council, acting by unanimity, with the consent of the European Parliament. The two institutions will start the negotiations and the Commission hopes for a quick adoption, before the next European elections that will be held in May 2019. In parallel, from end of May to mid-June, the European Commission will present detailed proposals for the future sector-specific financial programmes.